We always like to walk on a straight road. Whenever the fork comes in our way, we get nervous. It’s because we cannot decide which turn we have to take from this fork. We always fear the unknown. But, if we escape from that fork, we cannot move forward in life. And life will be stuck in the same condition. To move forward in life, we have to choose one between the two. We have to take a risk in life. If we choose the wrong way, we will learn from that. 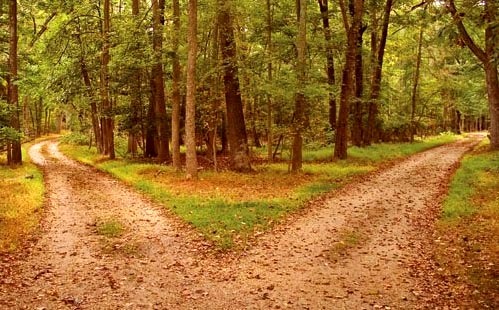 The lessons will help us to choose the right turn from the next fork. If we take the right turn from the fork, we can trust our intuition. Hence, we can gain from both of the turns. Right helps us to believe in our intuition and the wrong gives us insights. There is no loss on taking the turn from the fork. When you come to a fork in life where you have to decide your turn, select one by applying your insights or your intuitions. But take a turn. The fork is everywhere in our life path. Each moment, we have to face the fork and choose the turn. Our happiness, our suffering all depends on our choice. If one wants to be happy and find happiness within himself or herself, (s)he will be happy forever. If one thinks, suffering is easier than discovering the real happiness and prefers to stay in suffering, (s)he will suffer from his or her misery for the whole path of life. The fork in life is the test for us. This is the test of our courage. This is also the test of our ability to sustain in the constant struggle of life. So, to move forward in life you have to pass the test. You have to take a risk and choose your turn from the fork in the way of life. This post is the part of WP Daily Prompt- Fork. To view my previous post on Daily Prompt- Countless, click here. As you said, forks in the road are chances to gain insight or use intuition. Once one has good intuition, its as if there are no forks anymore. We can consciously feel through the situations and choose the best route every time. It takes a while to get connected with it, but when we do, it is definitely a joyful route. I think, those, who are conscious, don’t need to choose anything. They just flow with the stream of life. To them, there is no right, no wrong in life because they have already chosen to be happy in life. So, fork or road doesn’t matter to them. Thanks and glad to be in service. Thank you for visiting my blog and sharing your view. Glad to know that you liked it.